Chibi Kero: Secret of the Kero Ball!? 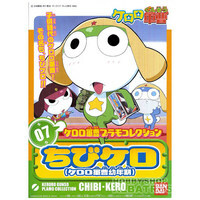 Plot Summary: Keroro, Giroro, Zeroro, and Pururu are your average Keronian tadpoles who enjoy nothing more than playing in their self-made secrete base. One day Giroro shows up at the base with something new and exciting the Kero Ball, a device that he borrowed from his older brother Garuru. Every one is excited to see what the Kero Ball can do, especially the young and juvenile Keroro, he quickly snatches the ball away from Giroro and begins to play around with it. Ignoring his friend’s words of wisdom against doing so Keroro pushes a strange button on the ball that creates a vortex sending the four friends inside the Kero Ball. Now the young tadpoles must overcome obstacle after obstacle in order to escape their dark prison and unravel the mystery of the Kero Ball. Distributor: Kadokawa Herald Pictures, Inc.